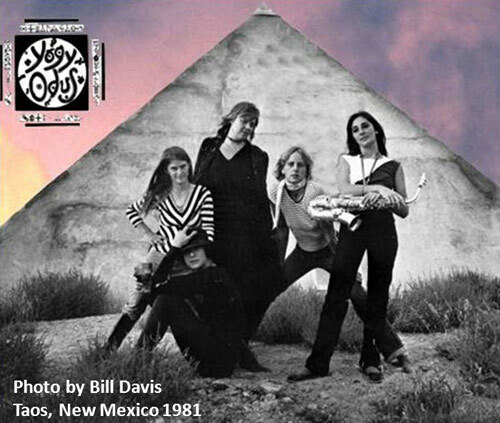 Yogy Odus, an all girl rock band based in Taos, New Mexico, was active from 1980 to 1984. The band toured small venues in New Mexico, Colorado, Texas and California. Yogy Odus produced original songs and covered an eclectic selection of pop tunes by artists such as: David Bowie, Talking Heads, B-52’s, Clash, Pretenders, XTC, Lene Lovich, Blondie and Patti Smith. Being offered $500 by Hells Angels to play a gig wearing bikinis. Having to wrap the equipment in aluminum foil at a gig in Golden, Colorado. It was due to radio station bleed over.